Whether you have built a DIY budget Windows HTPC DIY Budget HTPC Media Center Build and Giveaway DIY Budget HTPC Media Center Build and Giveaway We built a sub-$400 yet energy-efficient HTPC media center running Ubuntu. Now, we're giving it away. Read More or just want to start the next video on your desktop while lying in bed, you don’t need to get up. If your computer mouse dies, your Android can be a good backup. In fact, this is a great way to repurpose an old phone into a nifty trackpad for your PC! If you use an Intel-based computer, then you will love what the company is doing with the Intel Remote Keyboard. Download Intel Remote Keyboard [No Longer Available] on your Android phone or tablet. Download and install the Intel Remote Keyboard Host [No Longer Available] on your Windows PC. You will need to choose x86 or x64 depending on your Windows. If you aren’t sure what you are running, there are four easy ways to know if you’re on 64-bit Windows 4 Easy Ways to Know If You're on a 64-Bit Version of Windows 4 Easy Ways to Know If You're on a 64-Bit Version of Windows Are you using a processor that supports a 64-bit operating system and are you running a 64-bit operating system? The average off-and-on PC user probably doesn't know the answers to these questions, although they should.... Read More . Important: Make sure your Android and Windows devices are connected to the same Wi-Fi network. Your Windows PC will now show a large QR code. Just scan it with your Android phone’s camera (following the on-screen instructions) and the two devices will be paired. In landscape mode, the trackpad is shown full-screen till you bring up the keyboard, which is obviously an expanded view with more space. 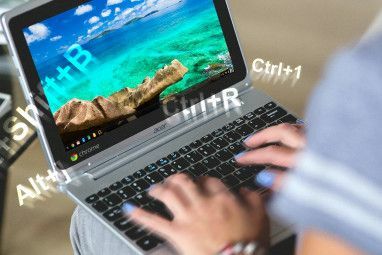 You can also use multi-finger trackpad gestures in Windows Every Windows 8 Shortcut - Gestures, Desktop, Command Line Every Windows 8 Shortcut - Gestures, Desktop, Command Line Windows 8 is all about shortcuts. 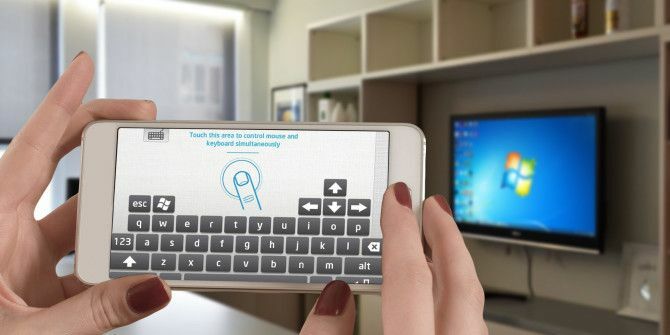 People with touch-enabled PCs use touch gestures, users without touch devices must learn the mouse shortcuts, power users use keyboard shortcuts on the desktop and novel command-line shortcuts, and... Read More . A single tap for left-click, two-finger tap for right-click, two-finger swiping to scroll. Swipe in from the right to bring up the Windows Start menu, swipe in from the left to see your recent apps. You can even connect multiple Intel devices to the remote keyboard on your Android. This way, you can quickly switch between something like the Intel Compute Stick for TVs Intel Compute Stick Turns Any TV Into A Windows PC For Just $149 Intel Compute Stick Turns Any TV Into A Windows PC For Just $149 Read More and your main PC. In fact, this app seems ideal to use with Windows-based HTPC computers, or something like the new Intel NUC Mini PCs What Makes Mini PCs so Small? And, the Best Mini PCs You Can Buy Today What Makes Mini PCs so Small? And, the Best Mini PCs You Can Buy Today A new generation of mini PCs is making its way into our homes and offices now. Read More , since you won’t need a separate wireless keyboard and mouse. Unfortunately, since Intel uses its own keyboard, you can’t use some of the best Android keyboards What Is the Best Alternative Keyboard for Android? What Is the Best Alternative Keyboard for Android? We take a look at some of the best keyboards in the Play Store and put them to the test. Read More . This was a big disappointment, since Intel’s keyboard feels like using a really old keyboard app. It is missing auto-correct, swipe-to-type, text expansion, and several other features. It’s decent enough for a quick search or two, but not much more than that. Also, you can’t adjust the trackpad’s sensitivity or the mouse acceleration. For my taste, it was a bit too sensitive. I eventually got used to it, but the ability to customize it would have been appreciated. Of course, the biggest limitation is that you can’t use the Intel Remote Keyboard app with non-Intel computers. We weren’t able to test if the app can control a PC running on an AMD processor, but if you do check, please let us know in the comments! Just to be clear, the Intel Remote Keyboard won’t let you control your full PC. 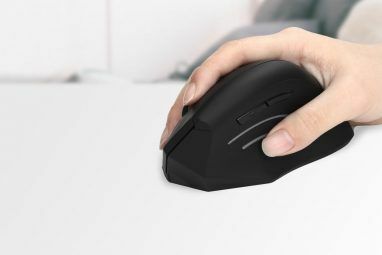 This is a virtual trackpad/mouse and keyboard for your computer. If you want more access, you can still control your Windows 8 PC from your mobile device How To Control Your Windows 8 PC From Your Mobile Device How To Control Your Windows 8 PC From Your Mobile Device Sometimes it's nice to just plug your laptop into an HDTV and watch some Netflix — until you have to pause it or adjust the volume. Then you have to get up and walk across... Read More . Intel isn’t the first company to make an app that turns your Android phone into a trackpad/keyboard for your PC. The best app so far has been Remote Mouse. Remote Mouse addresses several of the limitations of Intel Remote Keyboard. It uses your preferred Android keyboard, whether the default or Swype or Swiftkey. It has a built-in application launcher for your installed apps. It has a built-in shut down / sleep / restart / log out remote. It supports voice typing through your preferred app. But there is a major, major problem with Remote Mouse: The free version has ads right at the top of the trackpad! So while you’re moving the cursor around, you might just end up tapping an ad accidentally. Annoying! Remote Mouse actually has some great features tucked away if you are willing to pay $1.99 to unlock each. You can unlock the ads. You also need to spend that to get a function keyboard in landscape mode. And you can pay to unlocked a media remote control panel, which supports popular apps like iTunes, Powerpoint, Windows Media Player, and more. There’s also a similar Spotify remote, a Web remote, and lots more. To make Remote Mouse truly functional, you will pay anything between $4-$12. Oh yeah, and it works with Mac OS X, too. What Do You Remote Control With Your Phone? Turning your phone into a remote control is one of the best ideas to reuse old phones 8 Creative Ideas To Recycle Your Mobile Phone Without Throwing It Out 8 Creative Ideas To Recycle Your Mobile Phone Without Throwing It Out Recycle mobile phones. I wish that should be the catchphrase for all of us to live by. While researching this article, I came across quite a few official mobile industry websites of consumer rich countries... Read More instead of throwing them away. It doesn’t have to be an old phone though, using your main handset is super convenient. Apart from your PC, what else do you want to control with your phone? How do you do it? Explore more about: Computer Mouse Tips, Intel, Keyboard, Remote Access. My favorite controller apps have always been a combination of Universal remote and Splashtop. Universal remote gives me remote access to my files and acts as a highly receptive and smooth controller. Splashtop lets me visualize my desktop without ever needing to be physically near the PC. Splashtop is great! Totally agree there. I haven't use the paid version, but the free version works really well. Interesting. Free version has ads, it says. They show up on screen? That would be annoying. I've found that Teamviewer works just fine for systems where I need a remote view. There are also software-specific remotes for things like Plex and Kodi. I've tried Swift Remote for Plex. It's all right, not great.